I think in another life I must have been a magpie. I like bright and shiny stuff. There’s never too much ribbon on a package, never too many lights on a Christmas tree. If it’s colorful, small, shiny, or lights up, I go there, like a moth to the flame. I’m at a turning point in my planned trilogy. Book 1 is finished and I’m revising it, writing query letters, and sending it out. I’ve also started book 2, which is not going well, despite my best efforts to get the plot ironed out first. Even so, I can’t seem to find the place where the story should start. So far I’ve torn up three versions of the opening. So it’s no wonder that I got distracted by the idea of writing a short story. It looked bright and shiny, a fun thing to do while I refreshed and recharged from finishing the long slog of book 1. For the short story, I knew the entire plot and all the characters. It’s based on a news story I saw on the BBC about a Japanese bookseller (although I’m turning this news story into a romance). I knew it would be a perfect short story. A perfect shiny solution to my book 2 problems! A month later, and my shiny perfect short story has turned into a slog. I know the acts have to come more quickly and maybe there’s only two turning points, but I was trying to fit in a third, and what could I possibly use for escalating tension and the crisis point? I can’t find another one. Are two enough? Do I actually have to research retail? The story seems so short and sort of boring. Can somebody throw me a rope so I can just crawl out of that pile of quicksand that’s sucking up my time? [Deep breath] So now I have one project I can’t start and another I can’t finish. I think I need a bright shiny object to attract my attention back to my manuscripts where it belongs. I know. 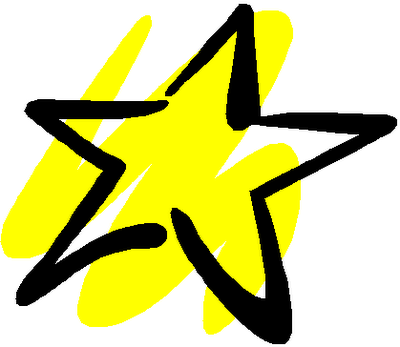 A gold star. That’ll do it. That and the rope. Tell me: Am I the only one? This entry was posted in Inspiration, Journey, Persistence, Planning and tagged first draft, Kay Keppler, McDaniel College. Bookmark the permalink. Hey, Kay, I hear you. I’m also a natural magpie. I love shiny things and brightly colored ones. The cheesier, the tackier, the gaudier it is, the more I gravitate towards it. Yes, I seem to remember that King Kong clinging to the Empire State Building statue you took home with you from NY. You’ll never know how deeply I coveted that. You’re just lucky I didn’t steal it from you. On the upside, last night when I was yet again reimagining my opening, I had yet another idea for it. So, yes, let’s swap! Perhaps this time’s the charm, the opening will work, and we’ll be off to the races. In a week or so I’ll have this opening done. Want to start with that? I’d have fought you for Kong 😉 . He’s now on my bookcase, next to the sofa where I do most of my writing. And he’s pure class compared with the sparkly pink rhinestone lucky horseshoe keyring I bought in San Antonio. Definitely let’s swap. I’ve done precisely zero writing this week (thank you, Life) so this will give me an excellent incentive to get my bum in chair and hands on keyboard. What’s stopping us? Bright and shiny and insane. Oh, there we go. It’s the fear of looking insane (or worse, having the reader sniff at us in disdain and leave us in the pool of madness we’ve created for ourselves). I’m trying to persuade myself to forget about outside validation and just write something that makes me happy. I tell myself that I can tidy it up later and fold the tinfoil properly under the beanie, straighten the tie and school that goofy look into something less demented. But some lazy part of me is whining, “But it’ll be so much WORK to make it presentable later. Why not inject just a little sanity into the process now, and make things easier later?” I need to put that lazy part into a box (or an attic . . . ), and get writing . . . .
Maybe try something shorter — haiku? Once you get a few hits of happy, the rest might come. Or not — but at least you’ll have a few hits of happy . . . .
You know what? That WAS fun! Kay, I have 6 stories in progress, all in varying stages precisely because of the appeal of bright and shiny new things. It’s like I’ve dated them all a few times but I’m not willing to meet the parents for any of them. I have no advice to give you other than ‘just keep writing something.’ Eventually, you’ll work things out.